"Dear Lord, if you want me there at the consecration, you might have to work some extra sort of miracle to make it happen." Now let me say that I have always had the utmost respect for those mamas who brave mass with little ones without a husband to help out. I have no idea how you do it. But, inspired by the fact that quite a few do, I decided that I'd take a deep breath and embark on the drive to town with all three car seats fit snugly on the back seat of my dad's truck. We made it through Mass. Barely. I was sweating. I held Mae on my lap behind Patrick and carried the combined Mae/Patrick weight up to communion since she had just bumped her head on the pew as we headed out of it, and promptly burst into tears. Together they weigh some 56 lbs (at least) so it was no easy feat. Mae, upon arriving, realized that Patrick was going to be in the carrier, and melted into tears. You see, Paul usually holds Patrick and Mass is Mommy-Maggie time. This change was not well received. After she calmed down (relatively) we (kind of) made it through the rest of Mass. What I mean to say is, that we were there for communion. And we were standing in the back for the rest. On the clothes front (since this is WIWS) I wore my favorite skirt (found with the tags on at a garage sale), with a hand me down maternity top (with a belt, so it doesn't look quite so "maternity"-ish), a cardigan tat kind of matches, since my red on was no where to be found, and my favorite yellow snood. 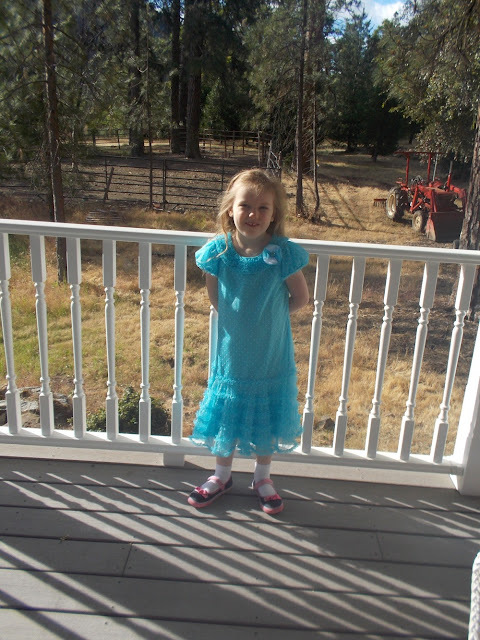 Sadie wore a brand new dress Nani got her at Costco. She calls it her "Laura" dress because apparently it reminds her of Little House on the Prairie. 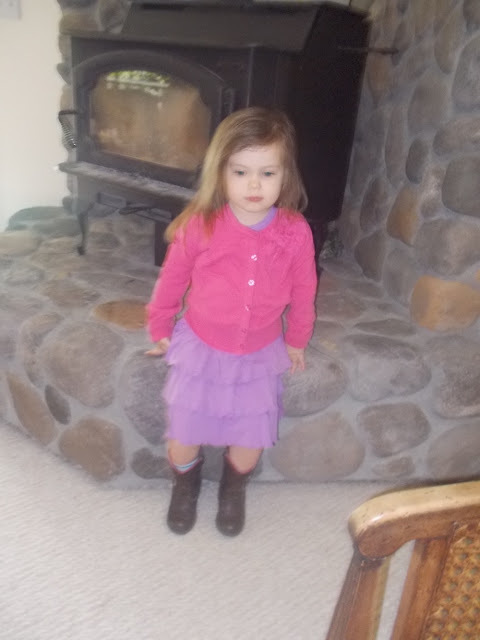 Mae wore a purple dress with a cardigan she obsessed over throughout Mass and her "Boots On" Cowboy boots. But hey, at least her hair was brushed. And Patrick wore his Super Man long sleeved shirt because it was a little cold when we left, and khaki pants (with bare feet, because apparently I'm not that together). We visited with everyone after Mass and Mae and Sadie both got to see their God Fathers and we survived getting into our car seats and going home (and we even went on the little walkway behind the church so Sadie could see the fountain). But yeah. Going to Mass as the only adult in the midst of a crowd of little ones is definitely not for wimps. For more WIWS visit Fine Linen and Purple! Ohhhh goodness I can't even imagine trying to get all the kids to Mass by myself! I'm trying to offer up my suffering during the crazy misbehavior so that at least some good can come of it? I think you look fabulous and the fact that you took three littles to Mass all by yourself if wonderful. But even better...your daughter was acting "just like a nun"! So cool! I have managed two on my own in Mass. Now I have three, and I am not sure how I would do it. 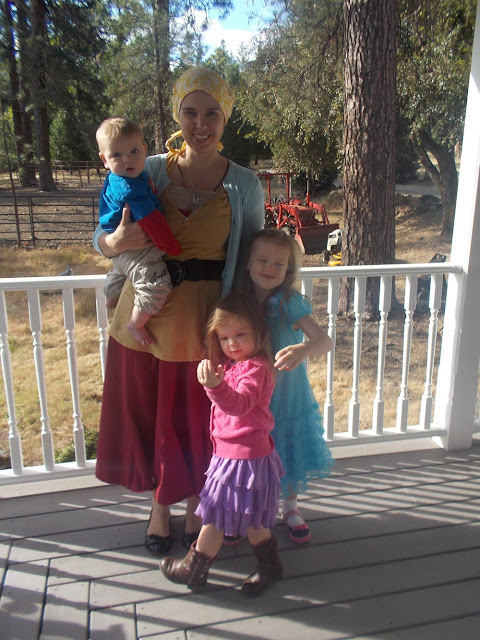 You all look very lovely and you are definitely a tough mama to get it done! Yeah...mass without a spouse and a little one is terrifying. Way to be! Def. would not guess that's a maternity shirt! I esp. love the colors and the belt. And, oh my, you are truly amazing for going with 3 littles!